This unique persuasive text takes the form of a fictional holiday to Mars, presenting factual information about the red planet. The text draws comparisons between Earth and Mars, and considers aspects of space travel such as weightlessness and the lack of oxygen. â?¢ Purple/ Band 8 books offer developing readers literary language, with some challenging vocabulary â?¢ Text type - A persuasive text. â?¢ A pictorial glossary is provided on pages 22 and 23 encouraging discussion and reinforcement of technical terms. â?¢ Curriculum links - Numeracy: Space, shape and measure; Science: Forces and movement; Geography: Contrast with the local area. â?¢ This book is paired with a story on the same theme: Star Boy's Surprise by Jana Hunter. 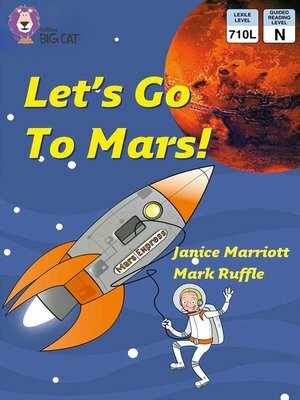 Janice Marriott is a leading writer of books for children and young adults. Among her best-known novels are Letters to Lesley and Crossroads, which won the 1996 NZ Post Supreme and Senior Fiction Awards as well as the Esther Glen Medal.